As of August 2000 current UA apprentices who complete their apprenticeship can earn up to 45 college credits for their experience with WCC. UA members can use this credit to earn an Associate Degree in Construction Supervision, Industrial Training, or Journeyperson General Studies from WCC. UA members who achieved journey status prior to August 2000 will need to pass the UA STAR exam in order to receive the 45 credits for their apprenticeship experience. Three credits of math and three credits of science (6 total) are awarded within the 45 credits for completion of apprenticeship or the UA STAR exam. Please contact your local training coordinator to set up an exam date and obtain study guides. Please visit https://nationalitc.com/nitc-star-level-certification-programs.cfm for more information on the NITC STAR level certification programs. 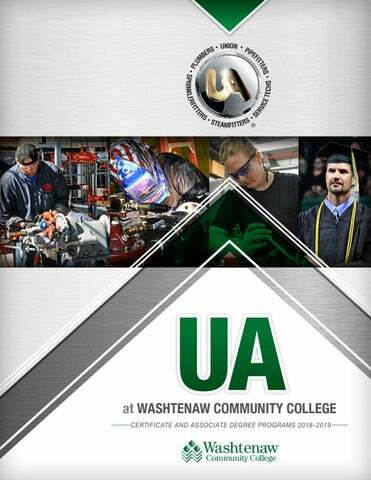 For course and credit information related to United Association apprenticeships available through Washtenaw Community College, see the UA Apprenticeship Credit Breakdown page.